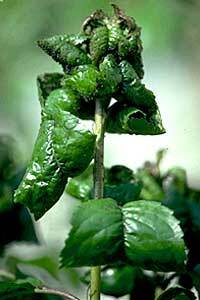 There are many species of aphids and all are a bit different in appearance, biology and the host plants attacked. Therefore, they will be discussed here in the general sense. Aphids are soft and plump bodied, have long spindly legs, are often wingless and posses cornicles, which immediately distinguish them from other insects. Aphids have a piercing-sucking mouth-type that is adapted to feeding on plant sap. 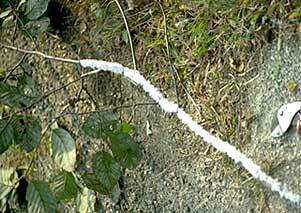 Their guts are long, coiled tubes and as the plant sap passes through this digestive tract, plant sugars (among other compounds) are concentrated out into their blood. The remainder of the sap in the gut is finally expelled as a clear liquid that still contains many plant sugars; this waste is known as honeydew. Honeydew appears as clear drops of liquid on foliage, as well as whatever is under a plant housing aphids, and acts as a food source for a group of fungi known as sooty molds. These molds colonize the honeydew and become very black, hence the name. 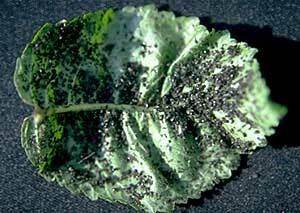 Heavy populations of sooty mold can make a plant quite unattractive and even interfere with the process of photosynthesis. Primarily, however, sooty mold is an aesthetic problem. 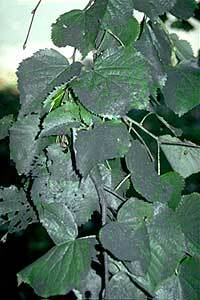 Occasionally, ants can be seen on foliage tending to the aphids and collecting their honeydew for its sugar content. These ants may also help defend the aphids against such natural predators such as ladybug immatures and syrphid fly larvae. 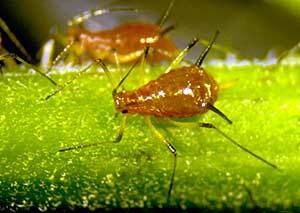 Some aphids are categorized as woolly aphids and these produce waxy strands over their bodies. One common member of this group is the woolly beech aphid which is primarily found on European varieties of beech (Fagus ). These are active in the spring only and produce large amounts of honeydew that may create aesthetic problems. Aphid feeding does not cause the typical yellow stippling injury to the host plant that is so common for most other piercing-sucking insects. 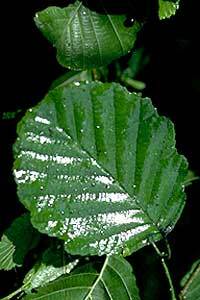 Although, they may cause leaf distortion if new, emerging foliage is fed upon. Winged females lay eggs on the primary woody host in the fall and then die. In the spring, these eggs all hatch to be wingless females. Upon maturity, these wingless females give birth to another generation of wingless females via parthenogenesis (asexual reproduction). After several generations of wingless females, crowding occurs and this most likely triggers a chemical cue that leads to a hormonal response within the population and a generation of winged females is produced. These winged individuals then disperse from the primary host plant and venture far and wide in search of a suitable secondary host plant. These can include numerous different types of plants such as weeds, annuals, vegetables, perennials and others. Once a quality host is found, the winged female will then produce a generation of wingless females on this plant. Several more generations of wingless females will follow until late summer/early fall when a generation of winged males and females are produced that will seek out the primary host plant species for that specific aphid species. They will then find a mate, the female will produce eggs, and the adults will then die. The eggs will over-winter and hatch in the spring. 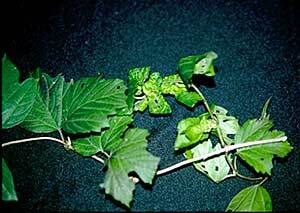 Aphids can cause curling of the foliage, as with the Snowball Aphid on certain viburnums, and much honeydew that can lead to unacceptable levels of sooty mold. To deal with sooty mold, one must manage the aphids. Several common groups of predators occur naturally and visual monitoring should be performed to determine their presence and numbers prior to administering any chemical controls that may be extremely detrimental to their population numbers. These natural controls include: ladybugs, lacewing larvae, wasp parasites, and syrphid fly larvae, among others.